A piece had been temporarily removed and he was staring at the wall for minutes. Was he contemplating how art restoration works? Noticing the imperfections in the wall? Or was he also thinking about nothing, letting his mind wander aimlessly? Another work in the series hung next to it, and it was an excellent example of how the brain can add so much information to so little. Almost immediately, I saw depth – the red mark is clearly closer than the yellow one. The black strip creates a wall, and the red mark sits in front of it, while the yellow one lies along it. This Ad Reinhardt piece also has a depth to it. As you stare at it, you become aware of the subtle variations of color, seemingly showing objects at various points in space. “Fiery Sunset” by Alma Woodsey Thomas also engaged in optical effects we’ve previously discussed – equal luminescence i think. Things in the periphery almost seem to move, and your eyes buzz as you stare at it. 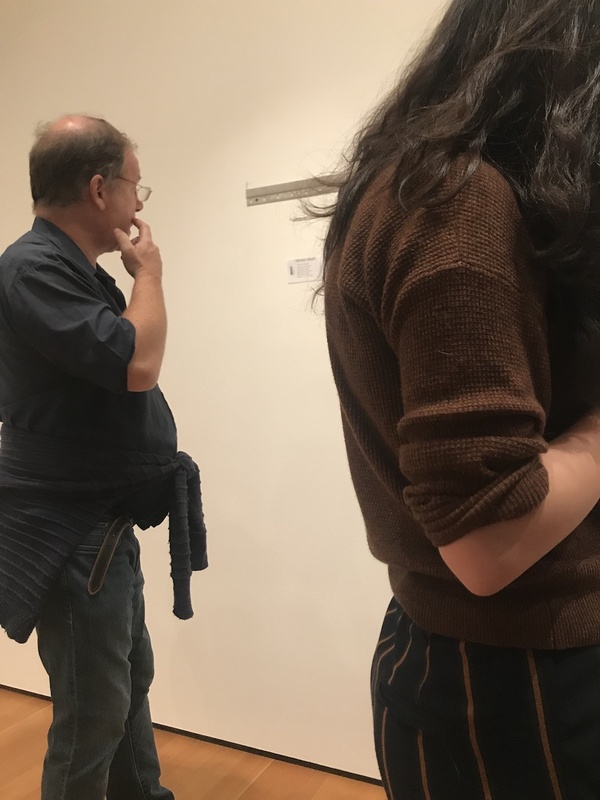 It was nice to see Duchamp’s work in the MoMa, now that I’ve learned more in this class and in Recurring Concepts in Art. A shovel, similar to one that hung from the ceiling his apartment, ends as an object in a museum. Also on display was this piece that questioned the value of standards. It’s only downside is you’d have to hear the story of the piece to understand it. While many of these pieces may be considered to use or depict ‘nothingness,’ I’m not sure there is a true “nothing” – it is a signifier for the absence of something. The only things that are nothing are those that have never existed, and therefore cannot be imagined. But for philosophical purposes, its use as a signifier provokes thought about the absurdity of existence.